These hats are high quality fur hats made for the brutal Canadian winter. They are well made, very warm, and fashionable. These lined white shadow fox hats with white leather tops will keep you warm, yet fashionable in the coldest weather. Genus and species: Vulpes lagopus. These lined black fox hats are made from dyed blue fox and have a suede top. 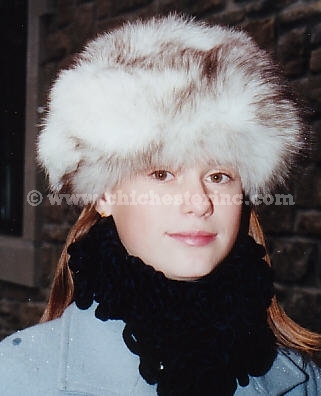 The fox hat is lined and made from high quality red fox skins and tails. Genus and species: Vulpes vulpes.